Indianised Lebanese Tabouleh Salad.Confounded?In indian context what is a salad? In the most down trodden, bare minimum, stripped form it’s the green salad made with one sad little cucumber, one tomato and one onion cut and artfully(not!) placed on a plate ,served as a dish which in my opinion no one who isn’t a heart or a diabetes patient ever touches. instead which saves us the time and space to forage another new ingredient. 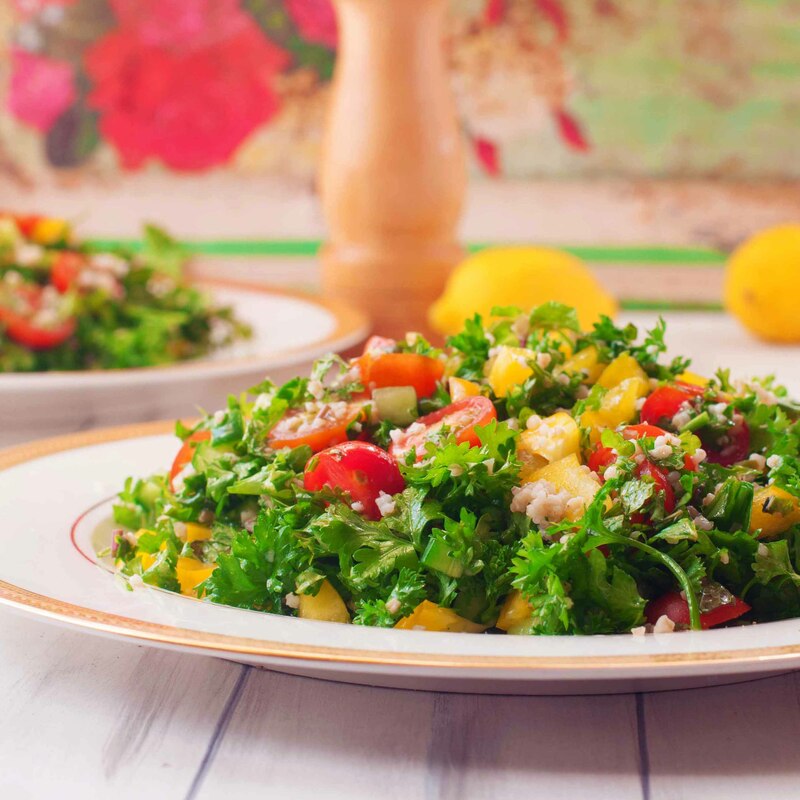 A Lebanese Tabouleh Salad is made with lots of parsley,some finely chopped diced vegetables and a simple vinaigrette which is just olive oil and lemon juice really.The main star here is the parsley and that’s the reason we have to use a whole cup or more of chopped parsley. Tabouleh is a great salad to carry to work(or wherever!) because it doesn’t have the wilty lettuce leaves which lose all their shape and character the minute dressing touches them.Parsley is a far more robust green that not only gives body to the salad but also enhances it’s flavour cause it has so much personality. and the sweetness from the cherry tomatoes. Do Check out some of my other most frequented salads- Avocado Quinoa Salad, Summer Melon Salad with Ricotta Cheese & Quinoa Pumpkin Salad & Grilled Eggplant Salad. Cut the vegetables with a sharp knife into small cubes which have a bite but are small enough not to overpower. Just Mix everything together in a bowl.Add the veggies, leaves first followed by the Extra Virgin Olive Oil, lemon juice and salt. instead.Same quantities and method really. Some Tabouleh also have onions in it-You could add green or red onion.When using onions in salad its important to macerate them so that the raw pungent taste is removed.To macerate an onion- cut it into vertical slices and mix it with a generous amount of lemon juice.